The first settlement of what is now Genesee Township was in 1834. By 1840 twenty-six families were establishing homesteads. The first school was started in 1837. Also in 1837 a Methodist minister began to hold services in various homes. Class meetings were held by the Christian Church, also in homes, in 1839. 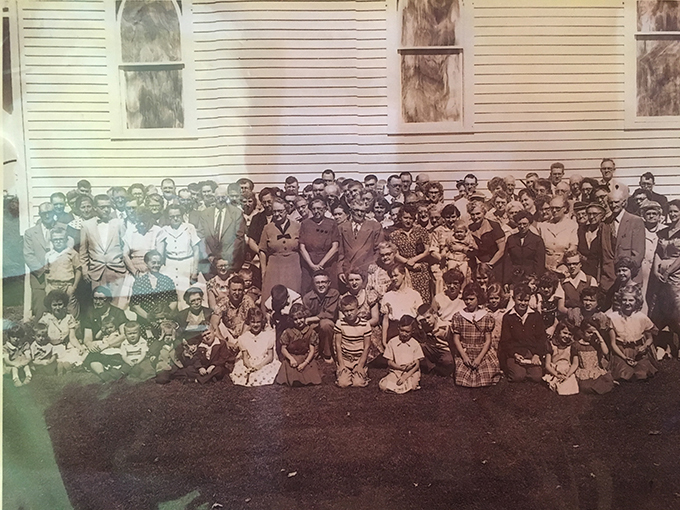 Martin Overholser and members of his family had joined the United Brethren Church soon after it was organized in Tuscarawas County, Ohio. Under their leadership in 1854 the Hazel Green Class of the United Brethren Church was organized. On July 1, 1858, George and Susanne Hurless, for one dollar deeded a plot of ground upon which to build the church. The church probably was of log construction and built by the men of the church. It was located on the south side of the road across from the Hazel Green cemetery where many of the early pioneers rest today. According to very early histories, this was the first church to be erected in Genesee Township. In 1866, the membership was 74 and the present church in Coleta was erected. Land for the present location was given to the church by Martin Overholser. The church, as it was then, had a long porch across the west side and there was an entrance at each corner. A wooden partition down the center divided the church. The men of the church sat on one side and the women on the other, following a custom of people of their background. The church was heated by two wood-burning stoves, one on each side of the partition. By 1878 it was felt that a parsonage should be provided for the pastor and his family and the house directly across the street from the church was purchased for $830 cash and a mortgage of $400 was assumed. By 1883 the church had attained a membership of 125. The first remodeling on the church was done as nearly as can tell during the summer of 1910. The porch across the front was torn off and a portion of the basement was dug out and cemented to make a classroom. The entrance hall and tower were added and the large window to the west was installed. The partition down the center was removed and gas lights were installed. Pews were installed facing toward the southwest corner where the platform with the pulpit furniture was located. In 1916 the Sunday School enrollment reached 172. It became necessary to provide more room for the Sunday school classes, so it was decided to excavate the basement under the entire church. A furnace was installed, a kitchen provided, and the balance was made into classrooms. In 1928, the interior of the church was extensively remodeled. The platform was built across the front with a stairway to the basement classrooms. A curved altar rail was constructed. Water had been piped under the road to the church from the parsonage in the summer of 1951. In 1953 the passageway to the basement at the rear of the church was remodeled and a modern restroom installed. In 1946 the United Brethren Church merged with the Evangelical Church, and we became the Evangelical United Brethren Church. In 1963 an addition was added to the north side of the church with two classrooms, office, coatroom and grade entrance on the upper level. 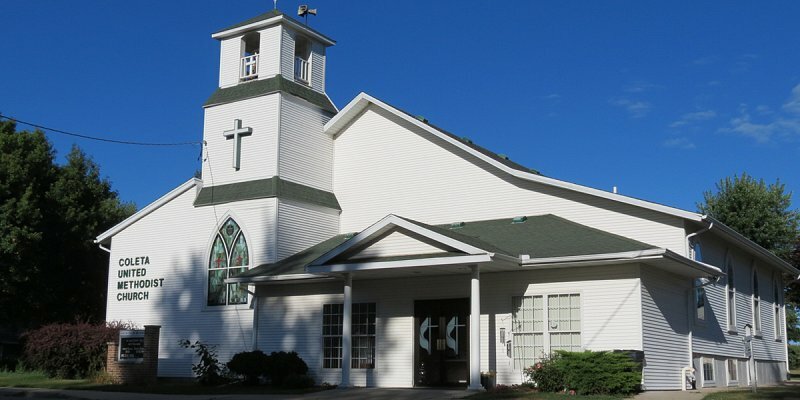 In 1968 our church merged with the United Methodist and we became the Coleta United Methodist Church. The Coleta Grade School closed in 1979, and the church became the hub for social activity in our small community. In 1981 a lighted cross was purchased and installed on the front of the church below the bell tower in memory of Martha Shuman. The groundbreaking ceremony took place July 5, 1998 with the work under the leadership of Jim Lubbs. The sanctuary was enlarged, and with Sunday school space, 200 people can now attend services. Two new handicapped-accessible restrooms, narthex, kitchen, elevator, handicapped-accessible front entrance with large foyer, cry room, central air conditioning and two furnaces were added. A new Pastor’s study was also included at the southeast corner. The basement extension provided extra classroom space, library and storage space. With our new modern kitchen we were able to provide a larger area for community and church functions. The Consecration Service for the new addition was held on November 22, 1998. When the Coleta Convenience Store closed, the church took on the responsibility of meeting more of the community’s needs. Senior citizens who used to meet at the store for coffee and talk were left without a place to gather. The church opened a “Coffee Nook” in the basement to the community for a couple of hours six days a week. July 4, 2004 was the date that marked our celebration and our independence from the building loan. On October 10, 2004 we celebrated our 150 anniversary with the burning of the mortgage. In 2015, the membership was 153.
Who are United Methodists? At the risk of stating the obvious, we’re Christians. There are 8 million of us in the United States and another 3.5 million in countries around the world. Our congregation is deeply involved in our own community and in outreach far from home. Both women and men are our clergy/pastors. We believe we are all in ministry together. Our decision-making bodies always include clergy and lay church members. We have two sacraments – baptism and communion – and our communion table is open to all. (Yes, that really means everyone.) We believe that many of the things that separate people from each other are more important to them than they are to God. Jesus of Nazareth, a Jew, was born in what we now call the Middle East between 7 and 2 B.C.E. (Before the Common Era). The human Jesus walked around ancient Israel preaching, teaching, healing and causing great consternation to the power structure. He invited everyone (that means women and children, too, in a male-dominated culture) to participate in the coming kingdom of God. He welcomed the social rejects and big sinners of his day. His challenge of the power structure led to his arrest by religious authorities – after his closest friends betrayed and abandoned him. Roman authorities crucified him (a horrible, but common, execution method) as a criminal sometime between 26-36 C.E. He forgave his enemies with his dying breath and after burial, he rose from the dead and appeared multiple times to his followers. To continue this story of how Christianity evolved – and how United Methodism entered the picture – you have to start grappling with the idea of the Trinity, a belief shared with other Christians. The concept of the Trinity is that there is one God who is revealed to us in three forms: God, the loving father and creator of the universe, Jesus Christ, God’s son and our redeemer, who was fully human and fully divine, and the Holy Spirit, God actually with us, awakening us to God’s will and helping us carry it out. A Sunday morning worship service is everyone’s initial concept of being part of a church. Indeed, Sunday service is a fixture, but John Wesley himself would tell you that worship happens every day – and in many ways. Today’s United Methodists are affirming to everyone that a church has many doors – literal and figurative. Church might include: a daycare program, a youth basketball league, a Bible study class, a “Habitat for Humanity” build team, a choir, a mentoring program for at-risk teens, a soup kitchen for the hungry, a food bank, a fund-raising project to end malaria, a wintertime homeless shelter, and any of thousands of ways people connect with others through the church. A basic concept is that Christianity is not practiced alone but in a community of believers who understand that “love” and “church” are both verbs. Jesus reminded the people of his time that the two great rules of life were to love God and to love your neighbor as yourself. That’s good advice to live by today.